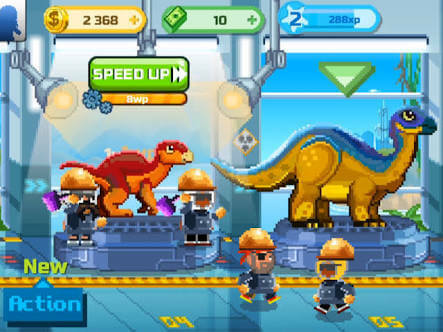 Oh Bibi’s Dino Factory lets players make dinos and sell them to eager buyers. But that’s not all, creating and selling these prehistoric beasts requires proper planning and strategy. You, the CEO of this factory, has to oversee everything, from choosing the right dino model to upgrading workers so that you can sell creatures at a higher price. You will also have to set the right price before selling a dinosaur to customer. The game also includes theme park management, allowing players to build buildings and attractions to keep customers happy. Social features of this game allow you connect with random players via friend codes. You can then hire your friends to expedite dinosaur manufacturing, give and receive gifts. There’s also a unique game mode called Dino Race that lets you choose the best dinosaurs and compete against friends. Step 1: You are an owner of a super secret lab and your objective is to create and breed dinosaurs to become the world’s best “dino maker”. All you need to do is tap an empty incubator and select a model. Choosing a model will require coins. Once you have selected a dinosaur model, tap on the incubator slot once again to send your staff members. They will try their best to create a dino from the chosen model as fast as they can. Step 2: The entire process to make a dinosaur from scratch is divided into several stages. You will have to tap the incubator to reach the next stage and keep tapping until you reach the final stages, where the egg hatches and a dinosaur reaches adulthood. Once the incubator moves to the next stage, it frees space for another empty structure. You can start creating a new dinosaur on the new incubator. Step 3: Each stage requires different amount of working points (WP) to be completed. The more WP a stage requires, the more time it takes to complete. In case a stage requires too much time to complete, you can tap the “Speed Up” icon to expedite stage completion. Once all stages are finished, your dino is ready to be sold to buyers in exchange of coins. It usually takes more time to complete in the final stages, so you can use speed-up in such cases. Step 4: At the end of a stage, the quality inspection team will analyze the grown-up dino and give a rating just before selling it to a buyer. The better a dinosaur’s rating, the more coins you will earn. The quality of each dinosaur has an impact on your overall “image”. Try to create high-quality dinos to get more profits. You will get an opportunity to finish quests, participate in events and complete special orders as you play through the game. Whenever there’s a quest on hand, try to complete it as soon as you can to get some really cool rewards. I would, however, recommend finishing special orders as they are the simplest tasks to complete. Just follow those orders and complete producing the required number of dinos to get rewards. Another way to get rewards is to complete a dino set under “Collection”. Check the numbered slots and raise dinos to complete a numbered set to get rewards. Earning money might not be an easy job at first. In order to get extra bucks, try to expand your dino park. Tap the “Build” button and construct those structures that drop extra coins. At some point of time, you will have to build another “Dino Dealer” for quicker sales. With another dealership, you can simultaneously put more dinos for sale and earn more coins. Mystery cards contain huge amount of resources, as well rare dino models. But it all depends on your luck. When the game begins, you will get a few free mystery cards, and one of the cards may contain a rare dinosaur. Throughout the game, you can earn a free card after watching a 30-second advert. Do grab this opportunity every time you see these offers. Quality: Show’s a staff member’s work quality. Improved quality will have a positive impact on your profits per dinosaur. Work Point: As we have already discussed, the more work point a stage requires, the more time it will take to complete it. However, an upgraded staff member will ensure that stages are completed faster. Stamina: Defines how much WP a staff member can produce before he is hungry (you will need to feed donuts to a staff member). Speed: How faster a worker completes a task. “Feed” button until the level up bar is full. This will improve all 4 attributes of a human worker and it will boost his performance. When a worker is exhausted, a pink donut icon will appear above him. Quickly tap the icon to feed him. You can also improve a staff member’s performance by using boost items. Tap a worker and then tap “Items” and choose a boost item to improve a certain attribute of a staff member. You can fine-tune a dino’s configuration and selling price. Tap a dinosaur when it moves to the dealer spot. A new window will open displaying selling options. Buy all options as it will increase a dino’s demand and reduce selling time. You can increase a dino’s price after buying all options. Do keep in mind that increasing or decreasing the price will affect the time taken to sell a dinosaur. If you increase the price of a dinosaur, it will take more time to complete a sale and the demand may dip a bit. You should go for a price increase when you are not playing the game for several hours. At some point, your dino will be sold at the chosen price. However, if you are impatient and want to sell it for quick bucks, just decrease the price. It will increase the demand and decrease the selling time. As explained in the Step 4, the quality of a dinosaur has an impact on profits and your image. You can improve the quality rating by leveling up your workers and using boost items to increase their quality attributes. There are two ways to make friends in Dino Factory: Linking the game with Facebook and adding FB buddies or sharing your friend code so that random players can add you. Make as many friends as possible so that you can hire them to complete work faster or get cool gifts from them. Tap the Action button and then tap “Social” to add friends. Use the comments section at the bottom of this guide to show your friend code so that others may add you.